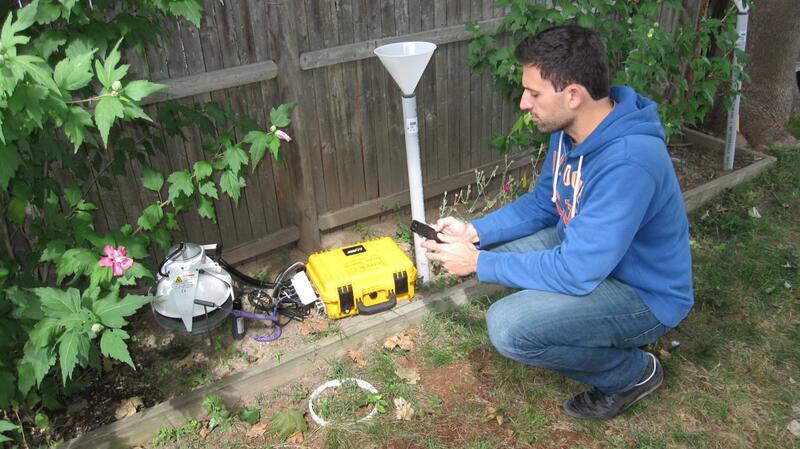 Stephen Decina, Boston University PhD student, measures carbon dioxide being released from the soil using an automated soil carbon dioxide efflux system. The equipment, which is controlled with a smartphone, passes air through an infrared gas analyzer and measures the concentration of carbon dioxide accumulation over time. Boston University researchers now have shown, however, that in metropolitan areas surrounding the city core, plant roots and decomposing organic material in soil give off enough CO2 , in a process termed "soil respiration", to make an unexpectedly great contribution to total emissions. "Very close to this concrete jungle downtown, where you have a lot of fossil fuel emissions and no soil, you have residential areas that have lower fossil fuel emissions and a whole lot of soil," says Stephen Decina, a doctoral student and lead author on a paper published today in the journal Environmental Pollution. "Over the growing season, CO2 emissions from soil respiration are almost 75 percent of the fossil fuel emissions in those areas. In some places, they're actually higher than fossil fuel emissions." "These biological fluxes are much larger than you'd expect," says Lucy Hutyra, Associate Professor of Earth & Environment and coauthor on the paper. "In our efforts to monitor, verify, and reduce greenhouse gas emissions in cities, we really need to pay attention to this." "We found that the average rate of CO2 coming out of the soil is highest in landscaped areas such as gardens, followed by areas with a lawn, and it is lowest in the urban forests," he says. These rates of CO2 release generally reflect the level of human interventions at each location. "People often manage their flower beds more than they do their lawns, and in general they leave their forests alone," Decina points out. "When people mulch their landscaped areas or fertilize their lawns, they're putting out yummy fresh highly decomposable carbon that soil microbes can use," says Pamela Templer, Associate Professor of Biology. "And that's stimulating microbial growth and loss of CO2 out of these urban soils." Their findings will help in evaluation of climate action programs such as Boston's Greenovate, which aim to reduce greenhouse gas emissions from cities like Boston. "Studies that rely on satellite measurements of CO2 don't distinguish between human-made and biological emissions. Our study shows that CO2 fluxes from soils, which come from biology (microbes and roots), can make a significant contribution to total CO2 emissions from a city like Boston," Templer says. "If you assume all the CO2 emissions in the city are coming from man-made sources like cars and buildings, and you don't account for what the soils are doing, then you don't have the correct information to assess whether your climate plan is actually reducing emissions," Decina says. "For a long time we've had the perception that biology doesn't matter in cities, because it seems that there's so little of it," Hutyra says. "But we show that biological sources are contributing a large amount of CO2." The BU team is going on to analyze urban flows of nitrogen, which are generated by cars, factories and farms and then deposited in high rates by precipitation or air particles. "Nitrogen is a limiting nutrient," Templer says. "A small amount of nitrogen from rain helps plants (whether they be in landscaped areas or forests) grow more. But too much nitrogen can be a bad thing for soils, waterways and human health." "Does a tree in the city do more or less than a tree outside the city?" Hutyra asks. "That city tree is growing in a very different environment. It has extra CO2, warmer temperatures, lots of nitrogen, lots of dogs, salt on the road, pipes that are leaking sewage and feeding it all sorts of nutrients, ozone, people cutting off its branches, and a whole suite of direct intentional and unintentional management." "We're increasingly recognizing the importance of coupled human-natural ecosystems research--understanding not just how nature works, or how humans affect nature, but how that all feeds back to one another," Templer says. One challenge in urban ecology is that researchers can't expect their equipment to stay undisturbed, says Decina, which is one reason why almost all of the CO2 study sites were in residential backyards. "This fieldwork is different than the kind that we're used to, out in the forest worried about bears," he adds. "In the city you don't have to carry bear spray with you, but curious or angry humans can often be more disruptive to a research site than a curious or angry bear."